Despite a popular campaign over many years from animal activists and many politicians to replace northern live exports with slaughter at export abattoirs, the experience of AA Co’s abattoir in Darwin suggests there is still no economic alternative to the live export trade for northern cattle, writes former Commonwealth public servant Brendan O’Reilly in this cross-posting from the Online Opinion website. ANYONE following the share market will have noticed a 40 percent decline (since the middle of last year) in the share price of Australia’s biggest beef producer, the Australian Agricultural Company (AA Co). Major reasons have included losses related to its Darwin abattoir, and a write-down of livestock values. Three years after opening its $100 million abattoir (employing about 200 people), AA Co has launched a review into the underperforming asset. AA Co’s recent ASX announcement notes that for FY18 it expects to report an EBITDA (earnings before interest, taxes, depreciation and amortization) loss “in the range of $30 million to $40 million. This compares with FY17 statutory EBITDA profit of $133.2m. Significant items related to losses at the Darwin Abattoir (Livingstone Beef) are in the range $60m to $65m….. The FY18 Statutory EBITDA expectation also reflects a decline in cattle prices relative to the end of FY17, resulting in an expected decrease in AA Co’s livestock inventory market valuation in the range of $70-80 million. AA Co’s experience is a sobering taste of reality in the face of a popular campaign over many years from animal activists and many (especially Labor and Greens) politicians to replace Northern live exports with slaughter at export abattoirs. AA Co made big losses from operating its (apparently unviable) new facility, despite it being the only substantial abattoir operating north of a line from Perth to Townsville. There is a real possibility that the Darwin Abattoir will be wound back or even shut down, and it is most unlikely that any other big abattoirs will be opened up in Northern Australia in the foreseeable future. In short, this all suggests that there is no economic alternative to the live export trade for Northern cattle. Over 75 percent of Northern properties are reported to be partially or completely reliant on live cattle export. We all recognise that animal welfare issues arise in relation to live export. What is important to realise is that all live export is not the same. Cattle are far more resilient travellers than, for example, sheep, even when being transported domestically by truck. The length of sea journeys, hot destinations, and condition at the time of loading all affect animal health en route. Proper ship design (e.g. non-slip floors, good ventilation, no overcrowding) is also very important. Sailing time from the Port of Darwin to Jakarta is just three and a half days, and the cattle have access to feed and water during the journey, something not possible during long distance transport by road to domestic abattoirs. Overall cattle mortality during sea transport to Indonesia (by far our largest live export market) is less than 0.1 per cent, and is only slightly higher to other Asian destinations, which take most of our export cattle. According to the RSPCA, sheep deaths on the way to the Middle East are significantly higher. They are lowest in the first four months of the year, rise to a peak in August and remain above 1% until after October. Mortality approximately doubles when sheep are transported from the Australian winter to the Middle Eastern summer (May to October). Good management and well designed ships are essential to ensure animal welfare and low mortality. Air-conditioned ships could potentially overcome problems with seasonal heat in the Middle East, which is a big issue for live-sheep export. A recent conference has heard forecasts that exports to Indonesia could fall from the 600,000 to 700,000 head sent in the 2014 to 2016 period to as few as 300,000 head in 2018 and beyond. From January to March this year 60,000 fewer cattle left Australian shores for Indonesia, than in the same period last year. There is said to be a lot of pressure (from Indonesia) on getting the export beef price down, and the importation of Indian buffalo meat has been hugely significant. Poor returns and frustrating business conditions have already caused Elders to cut its last investment ties with the live-export sector in Indonesia. It is selling its 8200-head feedlot and abattoir near Jakarta. The company has stated that “as with our decision to sell the live export business, return on capital was the primary driver, but we’ve also have found it increasingly difficult to do business in Indonesia”. In the context of AA Co’s and Elders’ experience, and market conditions in Indonesia, it is illuminating to look at the response of foreign owners of Northern beef properties. In October 2013, Japfa Santori, an Indonesian feedlot company, controversially bought Victoria River stations, Riveren and Inverway for about $30 million in a depressed market. The stations, cover 5500 square kilometres (over one and a quarter million acres) and included 40,000 head of Brahman cattle. Not long after the purchase, additional import quota to Indonesia was announced. In April 2014 another Indonesian company, Agri International Pty Ltd, bought Willeroo Station, a 171,000 hectare Katherine district holding with 20,000 head of cattle. Both Japfa Santori and Agri International have now sold out, possibly anticipating the slowdown in the live-export trade to Indonesia. In July 2016 Japfa Santori made a tidy profit, selling Riveren and Inverway (reportedly for over $60 million) to Gina Rinehart’s Hancock Prospecting. In April 2017 Willeroo was put on the market, and in October it was also sold to Hancock Prospecting for an undisclosed price. Australia’s largest privately owned cattle company has also been advertised for sale, with industry experts suggesting the company’s broad portfolio of beef assets could be worth $1 billion. The Consolidated Pastoral Company (CPC), owned by UK private equity firm Terra Firma, runs nearly 400,000 head of cattle across 16 stations, spanning 5.5 million hectares, and also operates two feedlots in Indonesia. James Packer had sold the CPC cattle station operations in 2009 for around $425 million. Firstly it seems that our Northern cattle industry and the regional economy of the NT would suffer a catastrophe if the live export trade in cattle was ended. Secondly, while investment in our Northern cattle industry by players such as the Chinese seems to be long term in nature, Indonesian investment may merely have been speculative. Some good may come from the difficulties in the live export market to Indonesia. It is risky to be over-dependent on just one export market, and exporters are already diversifying to other markets, with Vietnam and China showing particular promise. This opinion piece first appeared on the Online Opinion website, click here to view the original article. Brendan O’Reilly is a retired commonwealth public servant with a background in economics and accounting. He is currently pursuing private business interests and is a regular contributor to the Online Opinion website. As a person closely linked to importers and the exporters, I wish to say to all concerned Northern producers that you best keep that Darwin abattoir open. You might be needing it sooner than you think…. As for the Indonesian companies who ventured into N. Australia, they left for one reason .. they couldn’t make any money .. sure Santori bought well and then sold well but they saw the writing on the wall very quickly .. in all its a good outcome .. Indonesian Govn and industry now know that the grass is not greener in Australia .. they know the margins still lie with feeding cattle in Indo.. Thanks for the clarification. It reflects poorly on the government’s PR on aid expenditure. My hazy recollection is that none of the additional sheds you mention were closed due to live export competition. Mareeba was an AMH asset but had not operated for many years when AMH was formed in 1986. It was cannibalised and the property eventually used for rearing corn-fed chicken meat by Steggles. Coincidently I was CEO of Steggles when this investment was made. Tancreds operated Innisfail and it was closed after it was merged into Consolidated Meat before it was part of Teys. AMH tried to purchase Bowen but we were stopped by the courts and we wrapped it up with Mackay and sold them to Nippon Meat – AMH’s then largest Japanese customer. Bowen was closed when AMH sought to purchase and was again cannibalised. Ross River had a chequered career. Vestey did well to sell to David Smorgon and his well publicised failures in 1994 saw the plant close in February 1995. The boiler stack is now an historic monument in Townsville. Maryborough closed in 1995 when Morex went into liquidation and Maury Doube had his day in court. Again this demise was due to industry conditions and not live export. A most interesting treatise by Brendan O,Reilly and comments by John Gunthorpe. It should be remembered that the growing live cattle trade from the far North of Australia stimulated Northern cattle producers to substantially increase and improve their herds from about 1985 to probably 2005. This has meant that the Far Northern cattle herd has probably stabilised at a far higher number and production cycles are closely aligned to live export demand. It is unfortunate that the AA Co Livingstone abattoir is not as successful as hoped as it takes a great deal of guts, determination and of course capital to establish a venture such as this. Hopefully their day will come in the future, as it could offer producers greater market opportunities. As it stands the live export trade offers NT cattle producers the only realistic market for the type and volume of cattle produced. Australian Licensed Livestock Exporters now must ensure animal welfare throughout the feedlotting and slaughter process in the country of destination which although difficult is being achieved. This overall situation reflects the professionalism of the exporters,the Australian government and also the influence of animal welfare activists. Most slaughter capacity above the line drawn from Perth to Townsville was removed before live export started. Abattoirs at Cairns, Mt Isa, Pentland and Tennant Creek were closed in the early years of AMH. This was undertaken to increase the industry efficiency by increasing kills at the remaining abattoirs. Tancreds had the plant at Katherine killing buffalo and culls from the BTEC program. This was closed by Teys and is now cannibalised. When AMH moved cattle from the NT and north Queensland to Brisbane for slaughter, they were trucked to railheads and then railed over a thousand miles to slaughter. Queensland Rail had sidings where cattle were rested and watered. On longer trips they were rested twice on the journey. Certainly the AA Co investment at Livingstone is currently looking questionable. However to build a hot boning plant in the north to handle chopper cows and spent bulls is not the worst idea. There are many feral animals such as camels that could be processed if design permitted. Animals exported to Indonesia could be transported to the coast for slaughter. Of more concern is the announced decision by the Australian Government to spend $150 million over 5 years instructing offshore abattoirs in the humane slaughter processes*. This is at an enormous cost with little guaranteed upside even for live export. Asian wet markets are a way of life for those without housing refrigeration. 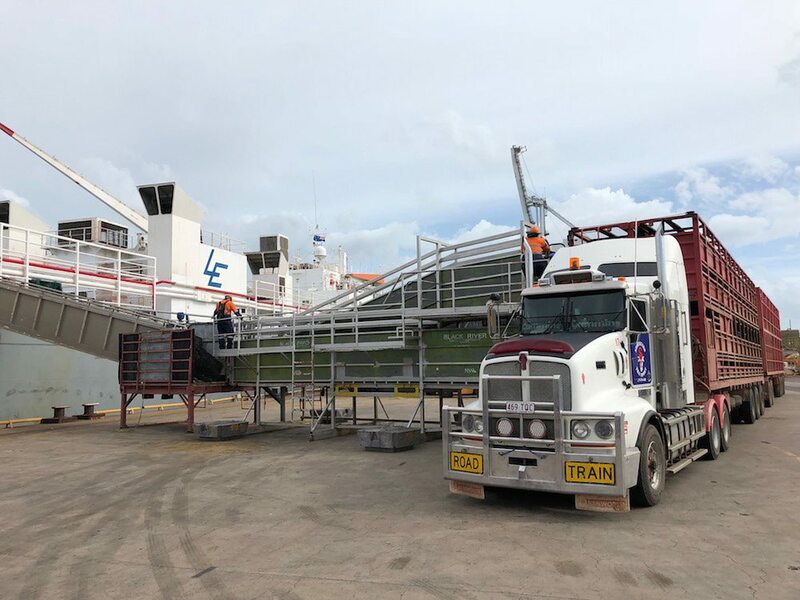 Live cattle export is unlikely to cease in the near term but be sure there is a strong beef processing industry ready to up their kills to accommodate any cattle unable to find a berth on the next ship leaving Darwin. * Some clarification needed here, John. It has been widely misinterpreted/misunderstood that the entire $144m government aid package to Vietnam announced earlier was for meat processing training. That is not correct. The actual figure for the meat processing component, supplied through DFAT, is $900,000 over two years. The confusion arose because the government’s original press statement was ambiguous, to say the least – simply describing the processing project as being ‘part of’ the broader $144m Vietnam aid project. This website contacted the minister’s office seeking clarification, but it took days for a response to arrive. By then, it was too late – industry stakeholders had drawn their own conclusions. Lessons learned, we hope.